It makes and real statement at your wedding reception and it’s delicious into the bargain – what could possibly go wrong? 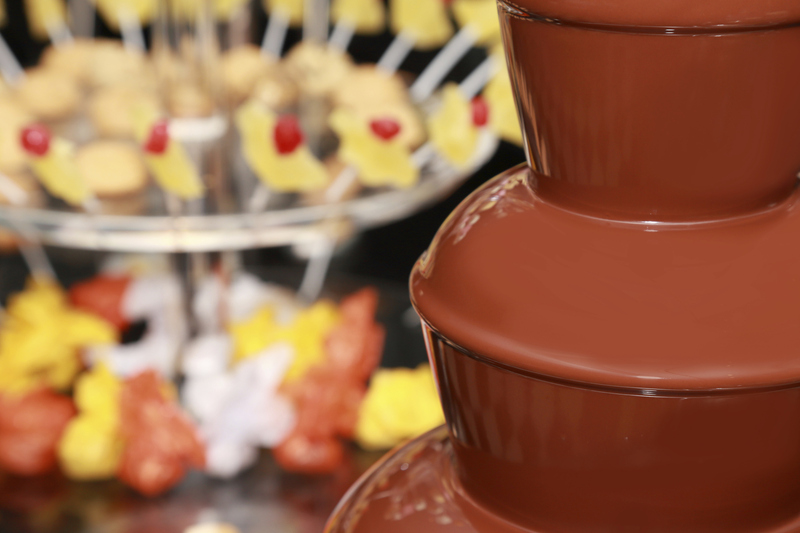 Find out all you need to know about the trend for wedding chocolate fountain hire. For those that haven’t met one – a chocolate fountain is a tall metal tiered assembly that continuously warms up melted chocolate. The molten choc rises up the inside of the fountain and gushes down the tiers on the outside. Guests are able to dip small chunks of fruit, cake, or fudge into the flowing molten chocolate using skewers or fondue style forks. Hiring an operator for the wedding chocolate fountain may feel like an unneeded cost, but they will make it worthwhile by topping up the chocolate, adding more of the dipping items, and ensuring the fountain is working properly. If you do decide to hire a fountain without an operator, be sure you have someone at your venue who has used chocolate fountains before and is willing to set it up so you don’t end up getting chocolate all over your wedding dress. Without someone who knows how to operate the fountain, your fantastic centrepiece might turn into an almighty disaster. 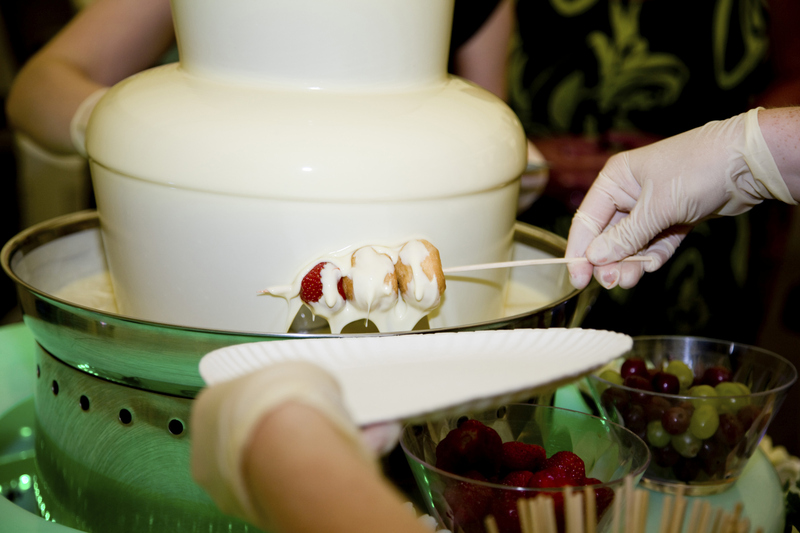 There are various times you could use the wedding chocolate fountain during the wedding reception. It might be traditional to serve savoury food at your drinks reception but you could have a fountain instead. It will definitely be something to keep your guests happy while you have your pictures taken. If you want to use the chocolate fountain as dessert you can start it after the wedding breakfast. Some couples opt to hire several miniature chocolate fountains and utilise them as table centres. This may feel like an expensive option but if you consider what you will save on a floral table centres as well as dessert, it may not be too costly. A table top chocolate fountain is a very sociable dessert and will provide your guests plenty to laugh about. You might even include forfeits for guests that drop their dipping item into the fountain a bit like a fondue. Your wedding chocolate fountain could even be used instead of a traditional wedding cake. In place of the traditional cutting of the cake, you and your new husband could be the ones to do the first dips and feed each other with them. Keep the chocolate fountain on during the evening reception to ensure energy levels are high for dancing. What are the different things you can dip? Let your imagination run free when you’re deciding what to dip in your fountain. Fruit is one of the better options, and strawberries, kiwi, banana, grapes and pineapple all work perfectly with chocolate. Cakes and cookies can be dipped too, with mini doughnuts, brownies, wafers, shortbread, and gingerbread among the favourites. Finally sweets are another possibility, and marshmallows and fudge are definitely classic favourites. Think about the colour of your chocolate when you choose the dipping items. The most traditional flavour is milk chocolate, but dark chocolate is thought to be a more elegant option, and white chocolate may be a little sweet but it creates less mess than the other two. Some chocolate fountain suppliers also provide specially flavoured chocolates such as strawberry, raspberry, or orange.